. يقدم فندق مانترا تريولوجي خدمات لا غبار عليها وكل أشكال اللياقة وحسن الضيافة اللازمة لإسعاد ضيوفه. يقدم الفندق مكتب الاستقبال على مدار الساعة, تسجيل وصول/خروج سريع, تخزين الأمتعة, واي فاي في المناطق العامة, صف السيارات لضمان الراحة القصوى لضيوفه. بالإضافة لهذا,تتضمن كل غرف الضيوف مجموعة واسعة من وسائل الراحة . بعض الغرف توفر حتى سجاد, مرآة, شباشب, غرف لغير المدخنين, مكيف هواء لإرضاء أكثر الضيوف تطلباً. صممت خدمات الاستجمام في الفندق والتي تتضمن مركز للياقة البدنية, مسار جولف - ضمن 3 كم, حمام سباحة خارجي, مسبح (للأطفال), حديقة لمساعدتك على الاسترخاء والراحة. يشكل فندق مانترا تريولوجي بخدماته الراقية وموقعه الممتاز، قاعدة مثالية للاستمتاع بإقامتك في كيرنز. It was 100 degrees outside and the AC did NOT cool the room. No wifi, small rooms and we asked for a large bed and they just pushed two twins together. We feel in the crack between mattresses all night. If you can afford this hotel, don't hesitate. Granted, we all got an upgrade to a 1 bedroom apartment ... but wow ... what an apartment it was. 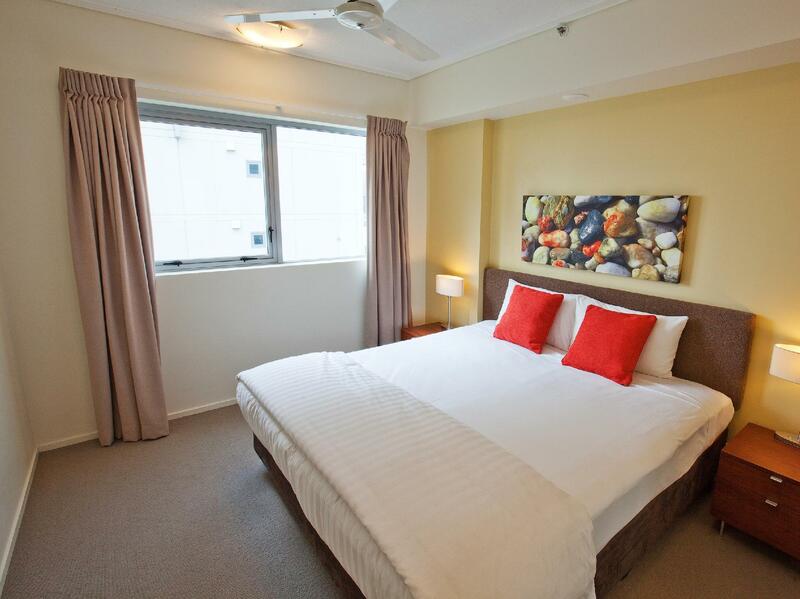 This hotel is on the Esplanade and about 1 minute walk to food and drinks. You can walk to the Marina if you want to explore the reef. Front desk was so helpful! Service can be lax at times in Australia now days, but these folks were cool professional and super helpful (my faith in Australian Staff was nearly restored from that one experience. Bedding - 10/10. Cleanliness - 10/10. Sofas etc - 10/10. A really great place to stay. I am an avid traveller and I rarely write a review like this, so I respect you are reading this without knowing me. But trust me, this place is super good. Again, we all got an upgrade! So possibly my review reflects that. Been enjoying for 6 days with my wife and a granddaughter. Nice building at very good location with kind and frriendly staffs. Swiming pool and Gym was good. It would be much better, if sofa is wide and folderable. TV screen needs to be bigger one. Kitchen has to be equipped with variable utensils. Carpark is too small. Wifi to be free. Luckily got the discount for Mantra apartment. Clean and equipped room. Wonderful location. Definitely recommended. Good hotel in perfect location! Only issue with this hotel is that they don't provide room service unless paid extra. We stayed for seven nights during Christmas/New Years period for premium price and when booking as regular hotel we would of expected at least the same service. If is ok if you book as holiday apartments, but if no brooms etc aren't available then some service is expected. If booking for couple of nights only, this is a great option. The location was great. The furniture was dated but when ur not in the room a lot it really was fine. Very clean and tidy could do with a coat of pain just to refresh the room, but we had a pleasant stay. good sized one bedroom apartment, clean, looked freshly decorated. Good kitchen with plenty of utensils, good bathroom including laundry. Pool area excellent especially after new sun loungers were delivered. Reception staff excellent and would always replenish any thing required - towels bath and pool, washer powder, dishwasher powder etc so although not serviced everything you needed was supplied. WIFI poor and expensive but don't despair free use of pc and printer in reception. 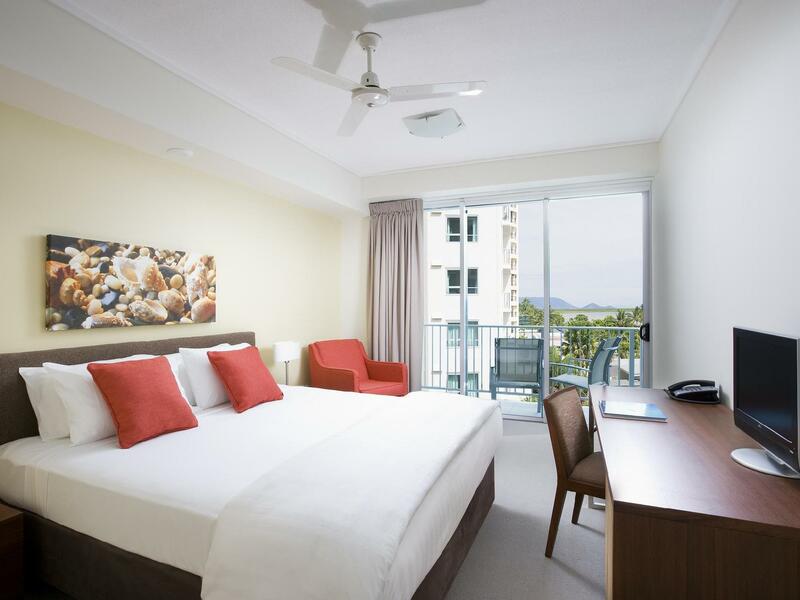 We had a lovely Stay at the Mantra Trilogy in Cairns, close to the places you want to visit, like all the different restaurants, ice cream, even closet the supermarkets for little extra things you need.I was really please that Cairns is so clean and no graffiti to be seen. If you want to go on any sort of tours the front desk will help you choose the right tour for you. Staff were very friendly wished you good morning have great day, so nice to acknowledged and not ignored. Very well equipped gym and wow a huge swimming pool to relax by when you need to just chill. All in all a very nice week away for us. Brilliant stay from start to finish. Friendly and helpful staff. Room was perfect, just what we needed. 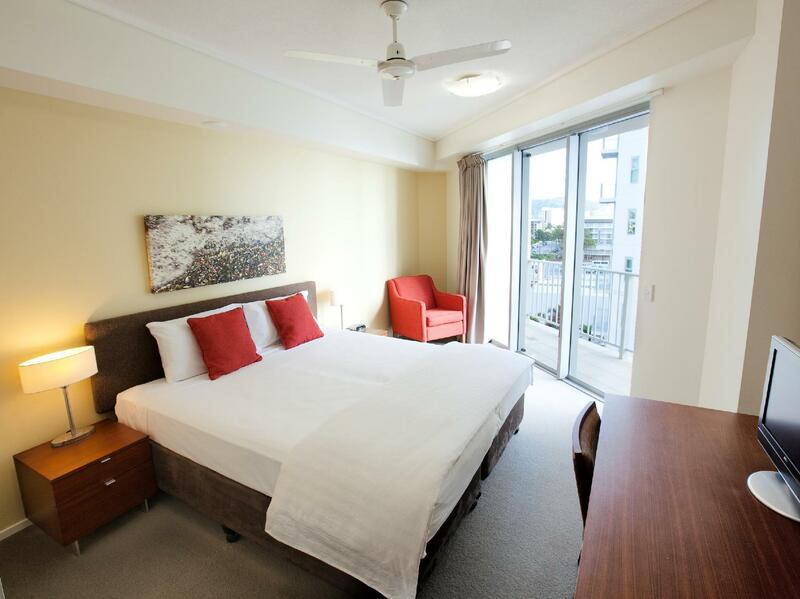 Nice 1 bed apartment overlooking the harbour area. Fantastic views to wake up to on a morning. Very comfortable and modern living space with all necessary amenities. The only thing I would fault on was not having an oven but instead a microwave oven. Other than that it was just what we needed. Would definitely stay again in a heart beat! 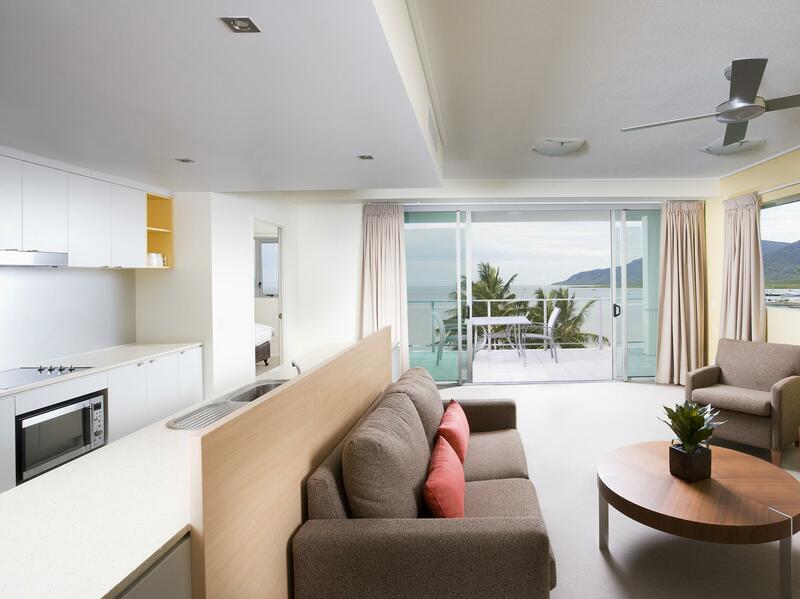 I was very impressed that this hotel is very clean, comfortable with very good view of both hotel pool view and sea view of Cairns. Spacious and clean room attracted me to stay in the room for long time. Large and full-equipped offered me convenience to prepare my breakfast everyday. Special laundry room allows me to bring less clothes as I can wash it easily. And also balcony relaxes me a lot as I could enjoyed my self-made breakfast. 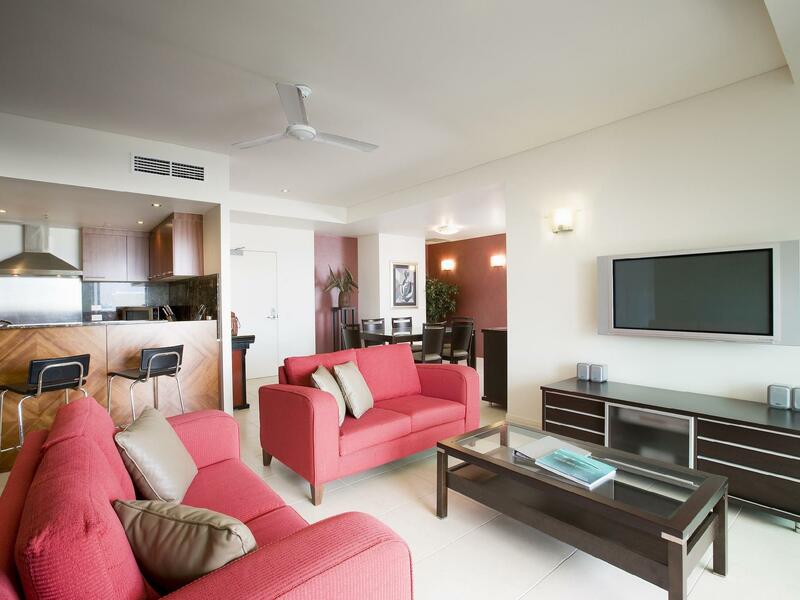 So I must stay in Mantra Trilogy Hotel when I travel to Cairns next time. The Hotel is nice but i was a bit discussed that there is NO room service available. So If you need fres towels or new shower stuff you have to organize that alone and make our room by your own. This is more the style of a furnished apartment than a hotel. So the value for money is not as good as it could be. I stayed at Mantra Trilogy for 4 nights, and everything was in a great condition, especially the location. The hotel is quite close to the port and restaurants. But there was no house keeping provided. We found lots of red spots on our legs during our stay and started to feel itchy . Then we saw lots of ticks on the sofa at the living room. Especially the cushion. We had to see a doctor after we came back home. The room looks clean but unfortunately not. 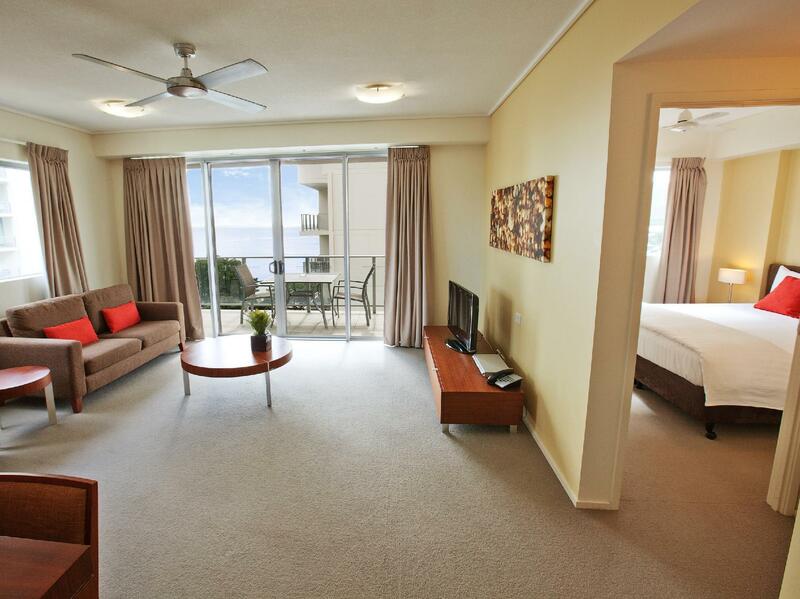 This is in a fantastic location, right on the esplanade close to everything you need. Unfortunately the room i had booked had a really bad smell. On further inspection you could see mould on the roof right near the air con! You could actually smell this as you enter the tower. When i took another look at the reviews, this had been noted as an issue several times so its unclear as to how they have not addressed this and allow guest stay in it!!! I spoke to the staff who were happy to provide me with another room. Which i add had a better view too (of the pool and ocean). They even gave me free wi-fi which was great. The first room whilst you could see the ocean had construction works happening. I found the staff helpful, they allowed early check in and late check out at no additional cost. Staff assisted with all my tours which offered pick up and drop off at the hotel. Overall, Great budget, great staff and location. Just ensure your room isn't in tower 3.